Debating society offers the opportunity to engage with controversial topics and current affairs in a structured and intellectual way. It also teaches speakers how to present arguments in public with confidence and clarity. 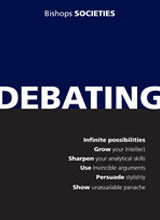 Above all, debating develops the ability to think and argue on one’s feet. Students may participate in Debating on two different levels and still reap the benefits of learning this important life skill. They can take part in social debating through the competitive internal league and social leagues with local schools and UCT or, if up to team standard, Bishops offers competitive league debating at both Jnr and Snr levels against other schools and competition and selection takes place until ultimately provincial and national teams are chosen. This enormously popular society has produced South African Schools’ team members, UN Schools’ debaters and speakers who enter debating competitions. Bishops hosts the Western Cape Provincial Debating competition in which some 60 schools and hundreds of speakers vie for Provincial selection. Bishops Eisteddfod includes 16 debating teams battling it out for group activity points. The annual Founders Day debate provides much hilarity with a joke debate between ODs and the current team on controversial Bishops topics. Model United Nations debating is an annual event at the Western Cape Legislature and we send a joint LEAP School/Bishops contingent as representatives of selected countries. Speaker and Adjudicator training at UCT twice a term is strongly supported by Bishops debaters. British Parliamentary style league debates are held at UCT and Bishops sends teams to participate in these events. Juniors Gr8s and Gr9s, (for coaching) meet Fridays at 14.00 (K block).10s and 11s meet Fridays at 15.15 (K6).Rotary teams meet Thursdays and some weekends, Debates take place Monday and Wednesday evenings.